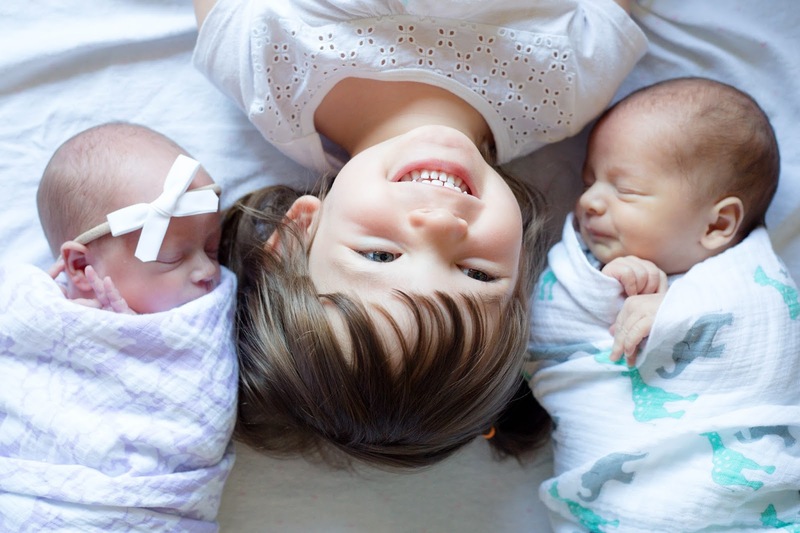 Right now, Claire is napping, the twins are having wiggle time on the carpet, and this seems like as good a time as any to write about how we're adjusting as a family with three kids under three. The honest truth? It has been SO MUCH BETTER than I ever thought. Or hoped. Or dreamed. 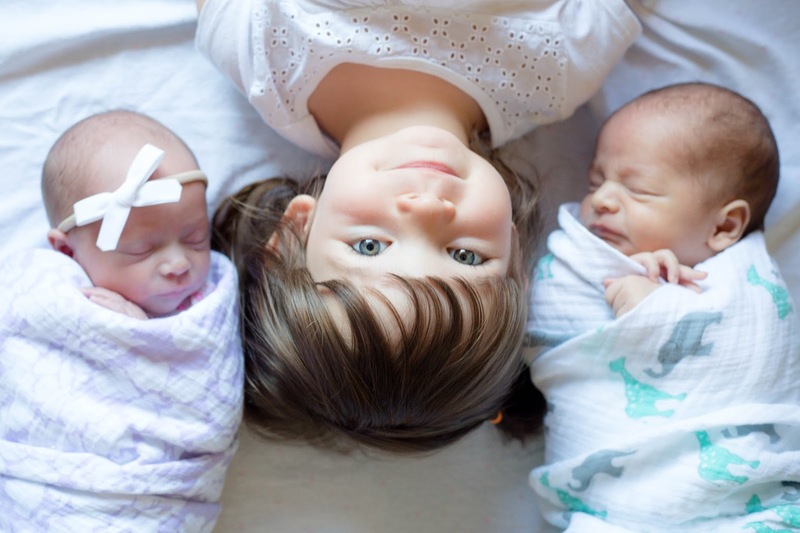 I guess I spent my entire pregnancy thinking that the newborn stage would be terrible: that I'd never sleep again, that everyone in my family would hate each other at the beginning, that I would have to hunker down and re-emerge into society three years later. In short: I was convinced the transition from one to three children would be way harder than the transition from zero to one child. Boy was I wrong. I haven't talked about this much on the blog, but when I had Claire, things were really hard for a long time. I was in the emergency room for a while, nursing was the absolute hardest and least natural thing for me, I was NOT good about letting things go or accepting help or sleeping when the baby was sleeping, and on top of it all, I had an undiagnosed case of postpartum depression. In short, I was head-over-heels in love with my daughter, but everything else in my life fell apart for a while. This time around, it has been much smoother and happier. I attribute this solely to my family that's been trickling in to help over the past month. Having someone to take the twins while I nap, or entertain Claire during the day has been fantastic. I don't know how I convinced them to come to Arizona during the miserable hot time of year and do nothing but change diapers and wash my dishes, but they came and I'll love them forever for it. Their help that first week really helped our transition be calm and smooth and happy. My recovery has been much better this time around too. I was expecting a loooong c-section recovery, but I'm actually feeling good. No complications this time around! And I can't even tell you how much nicer it is to have these babies on the outside of me than on the inside. Nursing has been going much better this time too. I pump between every feeding, and then bottle feed the twins. I switch off who gets breast milk and who gets formula with every feeding (Addison needs at least 50% special formula anyway because she's so tiny and struggling to gain weight, so it works out nicely.) Plus, this way I can bottle feed both twins at the same time and keep them on the same schedule. It also makes it easy for other people to feed them. I realize some moms might have done it differently, but I'm really happy to have found a solution that works for our family so early on. That being said, on my first morning alone with the kids, I had this moment. Claire was on her tenth tantrum of the morning, and it was just barely 8:00AM. Both twins were crying. Claire was crying. And I just looked around and started crying too. Ha! So sometimes there's crying, and sometime's there's sleepless nights, and it definitely took me three days to finish this blog post, but overall, we are happy. And that's a very good thing. Thank you so much for all your concerns and well wishes these past two weeks! Anything else you've been wondering about the twins or how we're doing?